Raised beds keep your veggies tidy, are good for the soil and make crop rotation easier. And you don’t have to dig up the lawn to put them down. 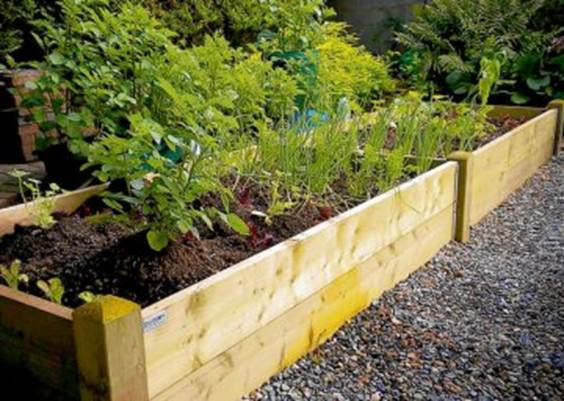 IF YOU ARE planning a dedicated vegetable garden, do consider a raised bed system. Although it is more time-consuming and expensive to build beds, or to get them built, there is a great feeling of satisfaction in having your crops all shipshape and organised in smart compartments. Raised beds always put manners on a space. Even if they are filled with weeds, the weeds look better-intentioned when they are neatly contained in a rectangular frame, rather than free-ranging dangerously through the garden. But aside from the gratifying matter of tidiness, raised beds have many other advantages. The soil warms up quickly, so you can plant earlier in the year. The extra height allows excess water to drain off, which is desirable with heavier soils. Because you don’t walk on the soil, there is no compaction, and beneficial soil creatures such as earthworms have an easier time, as do the roots of plants. Vegetables can be spaced more closely, as you do not need to leave room for paths. When the plants mature, they shade the soil, suppressing weeds and conserving moisture. Raised beds can be placed directly on top of existing lawns, so there is no need to dig up the grass. Crop rotation is easier to carry out and keep track of where you have three or four beds. Where soil is poor or stony, or otherwise unfriendly to vegetables, you can fill the raised beds with imported soil, or more easily amend the existing soil with compost, and so on. A width of one to 1.2 metres is ideal as it allows you to reach across without stepping on the soil. Make the beds as long as you like, but don’t forget you’ll have to walk around them to get to the other side. Leave sufficient room between them to move comfortably, and to run a lawn mower, if you have grass. You can build raised beds from bricks or stones – but remember, slugs and snails may hide out in the crevices of the latter. Wood is the most commonly used material, and is easy to work with. Organic gardener Klaus Laitenberger recommends using untreated larch or cedar, as he is wary of the chemicals that are used to protect wood. However, the organic organisation, the Soil Association, accepts timber preserved with Tanalith E (also known as Tanalised E), if the wood is treated and allowed to dry properly before the beds are built. In the US, the timber for vegetable beds is sometimes treated with linseed oil, but I have not seen it used here. If you want your timber raised beds to last, use right-angled metal brackets to fix the sides together. Or insert square-sectioned posts into the corners and screw the timbers to them to make stable joints. If you are replacing your lawn with a veg bed, Laitenberger suggests laying newspaper – about 10 sheets thick – on top of the grass. Then he fills the bed with a mixture of good soil and composted green waste from Envirogrind in Co Donegal (envirogrindltd.com). Compost such as this is made at such a high temperature that weed seeds and pathogens are killed. Enrich in Co Meath (enrich.ie) also make a suitable product. Of course, you can use your own soil and compost, if you have sufficient quantities. If you grow the same kinds of vegetables in the same beds year after year, pests and diseases can build up, and specific nutrients are depleted. Rotating crops over a cycle of three, four or more years keeps the soil healthy. There are many different crop rotation systems, with vegetables categorised into various groupings. Most plans are now carried out over three or four years, but some systems are based on a six- or seven-year turnaround. I’ve even seen a 12-year sequence, practised by a very assiduous organic gardener. A simple rotation plan is a three-year one: cabbage family (brassicas, including turnips and swedes), followed by the potato family and non-brassica roots (beetroot, carrot, parsnip), followed by everything else (beans, peas, onions, spinach). If you can’t manage this, just make sure you move your potatoes, brassicas and onions around each year. Crops that are in and out of the ground quickly, such as lettuces and other salads, can be squeezed in wherever there is room. If your DIY skills are negligible, consider getting in the experts. Andrew Davidson and Niall McAllister of Quickcrop (quickcrop.ie, tel: 01-5240884) are the answer to the ham-fisted vegetable-grower’s prayer. 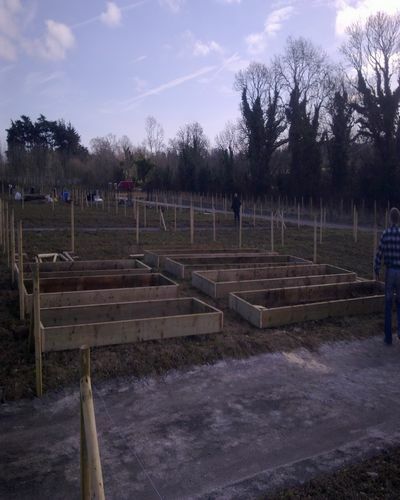 They offer kits to make raised beds (from €35 for a basic two metres by one metre bed); collections of vegetable plants (€25.45 for a beginner’s or children’s selection); and a complete range of instant vegetable beds, filled with perfect soil and compost, and ready-planted (€395 for a chunky two metres by one metre bed).